A tribute to british science fiction author Arthur C. Clarke whose books inspired me as I was growing up. 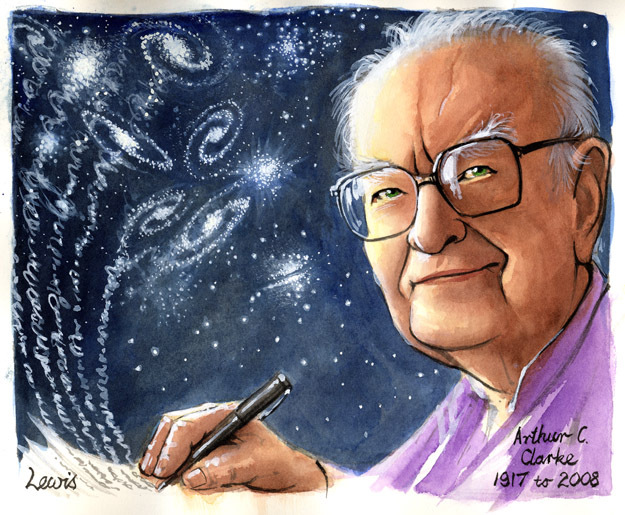 This entry was posted in Editorial Portraits, Memorial and tagged Arthur C. Clarke, author, death, memorial, S, science fiction, science writer, Sri Lanka, vale, writer on December 2, 2012 by Art by Peter Lewis. On the 11th of September 2001, 2 planes flew into the World Trade Centre’s towers, killing thousands of people. Osama Bin Laden went from being a minor middle eastern terrorist to the West’s greatest pariah. This portrait in smoke won First Prize in the Australian Rotary Cartoon Awards in 2002. 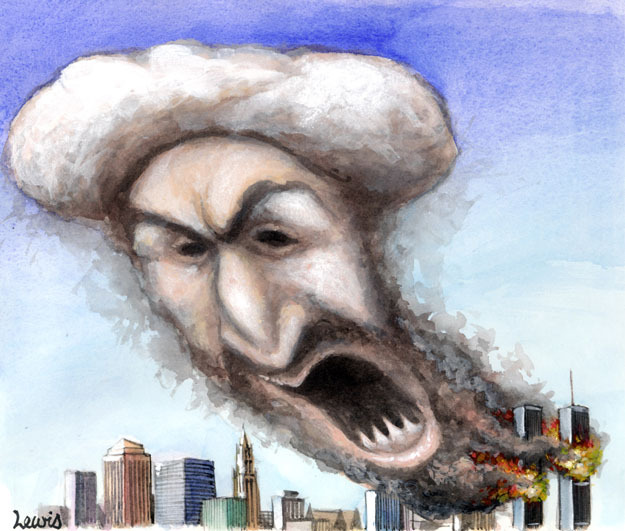 This entry was posted in Editorial Portraits, Memorial and tagged 9/11, America, Bin Laden, new york, Osama, Osama Bin Laden, taliban, twin towers, USA, world trade centre on December 2, 2012 by Art by Peter Lewis. 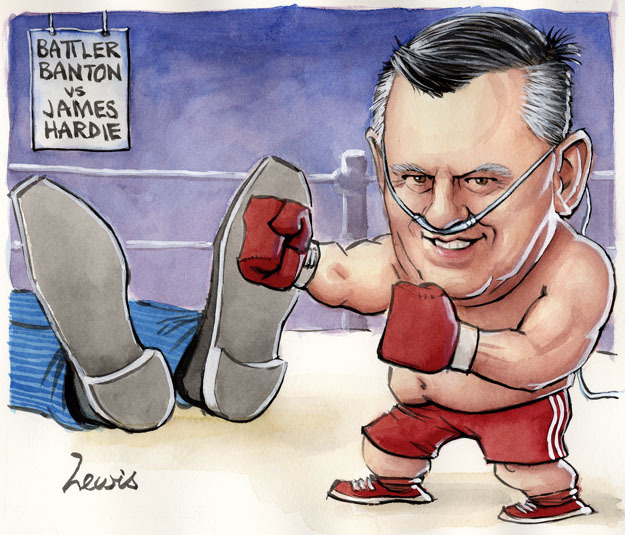 Bernie Banton was a tireless campaigner for people suffering asbestos related conditions caused by working for the company James Hardie. I met him in 2007 a few months before he died of mesothelioma and gave him an inked portrait as a keepsake. He joked at the time that the shoes should have been high heels because the James Hardie boss was a woman. 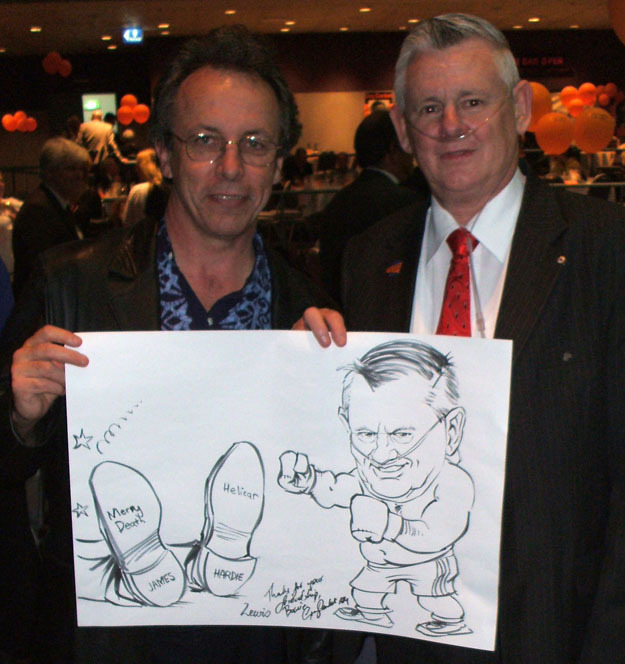 After he died I redid the cartoon in colour as a tribute and it appeared in the Newcastle Herald. The family requested the new version and it was used as a feature at Bernie’s funeral. This entry was posted in Editorial Portraits, Memorial and tagged asbestos, Banton, Bernie, Bernie Banton, death, environmental activists, memorial, mesothelioma, vale on December 2, 2012 by Art by Peter Lewis. A tribute to Len Evans, popular vigneron and entertaining wine critic based in the Hunter Valley. This entry was posted in Editorial Portraits, Memorial and tagged evans, len evans, vigneron, vintage, wine on December 2, 2012 by Art by Peter Lewis. Rene Rivkin, entrepreneurial stock-broker with a mercurial temperament that eventually got him jailed for insider trading, takes his own life after suffering bipolar disorder for several years. 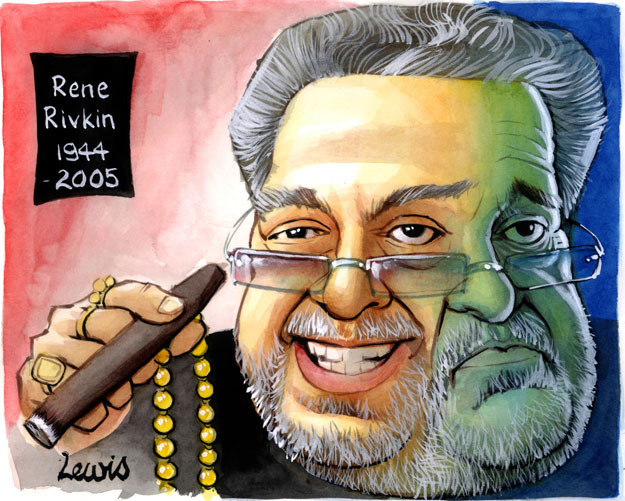 This entry was posted in Editorial Portraits, Memorial and tagged australia, celebrities, death, entrepreneur, investment, investor, market, Rene, Rene Rivkin, Rivkin on December 2, 2012 by Art by Peter Lewis. A memorial to Vincent Price, the master of horror movies in the 1950s and noted for his presence on Michael Jackson’s Thriller album. 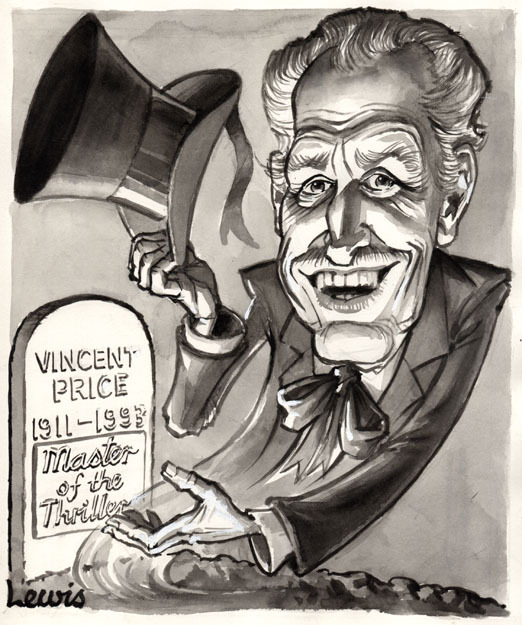 This entry was posted in Editorial Portraits, Memorial and tagged entertainment, Hollywood, horror, memorial, movie star, movies, Price, thriller, vale, Vincent, Vincent Price on December 2, 2012 by Art by Peter Lewis. A memorial to Neil Armstrong, the first man to step on the moon. 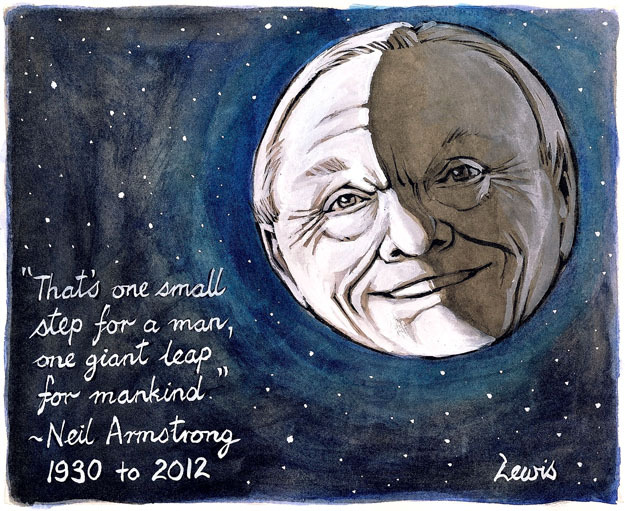 This entry was posted in Editorial Portraits, Memorial and tagged America, death, lunar, memorial, mission, moon, NASA, neil armstrong, USA, vale on November 29, 2012 by Art by Peter Lewis.